Washington DC’s messengers of Ska-Jazz are back with a new record, their first full-length release since the critically acclaimed “Tempus Fugit” and first release since appearing on Derrick Morgan’s live album in 2017. “Time For Change” embraces the band’s signature sound of bop jazz and Jamaican rhythms, and blends this with with soul, rocksteady, and reggae Whether in a smoky jazz club or on a festival stage they always deliver a dynamic live performance. That signature flexibility has led to them becoming backing musicians for many Jamaican greats, including Derrick Morgan, Roy Ellis, Dr. Ring Ding, King Django, and Mr. T-Bone. 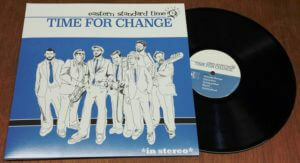 Formed in 1995, Eastern Standard Time began as a project to bring musicians from Washington DC’s jazz and Caribbean communities together to play music based on the original Jamaican Ska. Over the years the membership crystalized into a seven-piece group primarily blending American soul and jazz with danceable Jamaican rhythms from the 50s to the 70s. Eastern Standard Time has logged years on the road, with dozens of tours throughout Europe and North America to their credit. As 2019 dawns Eastern Standard Time will be touring throughout Europe, North America, and beyond in support of Time for Change. Heavyweight black vinyl pressing for premium audio quality. In celebration of our upcoming CAPITAL SKA & REGGAE REVIEW in DC – kicking off Memorial Day weekend in style- we are creating a DC VINYL FOUR PACK! Get black vinyl editions of THE FUSS “Ourselves” LP – LOVING PAUPERS “Lines” LP and he brand new SCOTCH BONNETS “Come On Over” LP and EASTERN STANDARD TIME “Time For Change” LP for only $50 postage paid! We’ll toss in a Blue Beat DC drink coozie too! 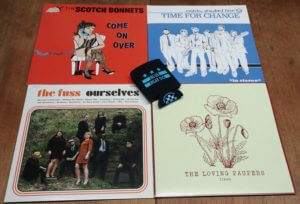 Next post: THE SCOTCH BONNETS “Come On Over” LP + 7″ vinyl / CD/ Tapes – produced / mixed by Dave Hillyard & Agent Jay of The Slackers!